Geneva – IOM, the UN Migration Agency, reports that 71,779 migrants and refugees entered Europe by sea in 2018 through 5 September, with 31,040 to Spain, the leading destination this year. This compares with 125,613 arrivals across the region through the same period last year, and 289,681 through a similar point (6 September) in 2016. Spain, with over 43 per cent of all irregular arrivals on the Mediterranean through this year, has outpaced Greece and Italy throughout the summer. Italy’s arrivals to date – 20,250 – are the lowest recorded by IOM since 2014, lower in fact, than arrivals recorded by Italian authorities during many individual months over the past five years. The same can be said for Greece, whose totals for irregular migrant arrivals through the first week of September this year (19,564) are nearly identical to those of Italy (see chart below). IOM Spain’s Ana Dodevska reported Thursday that 31,040 irregular migrants have arrived by sea this year via the Western Mediterranean, of those 8,109 arriving in the 36 days since the start of August, a rate of 225 per day. Additionally, at least 4,575 migrants have arrived irregularly in the region by land (see chart below). IOM’s Missing Migrants Project (MMP) has documented the deaths of 1,565 people on the Mediterranean in 2018. Most recently 16 people lost their lives in three separate shipwrecks in the Western Mediterranean. On 3 September, Salvamento Marítimo, the Spanish maritime safety agency, rescued 30 migrants from a half-sunken boat in the Alboran Sea between Morocco and Spain. According to survivors’ testimonies, collected by Spanish NGO Caminando Fronteras, five people drowned before they were rescued. Their bodies could not be recovered. On 5 September, 53 survivors and the remains of four men and one woman were recovered from a sinking boat, 62 miles south of Alboran Island, and brought to the Port of Motril, Granada. On the same day, Caminando Fronteras reported that six people were lost at sea in a separate shipwreck, as reported by 52 survivors rescued by Salvamento Marítimo. Since the beginning of the year, 329 people have lost their lives in the Western Mediterranean. That compares with 224 fatalities recorded in the Western Mediterranean through all of 2017. On Thursday, IOM Athens’ Christine Nikolaidou reported that over seven days (29 August–04 September) since last week Hellenic Coast Guard (HCG) units managed at least three incidents requiring search and rescue operations off the islands of Samos and Kos. The HCG rescued a total 131 migrants and transferred them to those respective islands. Additional arrivals of 665 migrants during those days to Samos and Kos – as well as to Lesvos, Chios, Rhodes and Megisti – bring to 19,564 the total number of irregular arrivals to Greece by sea in 2018. 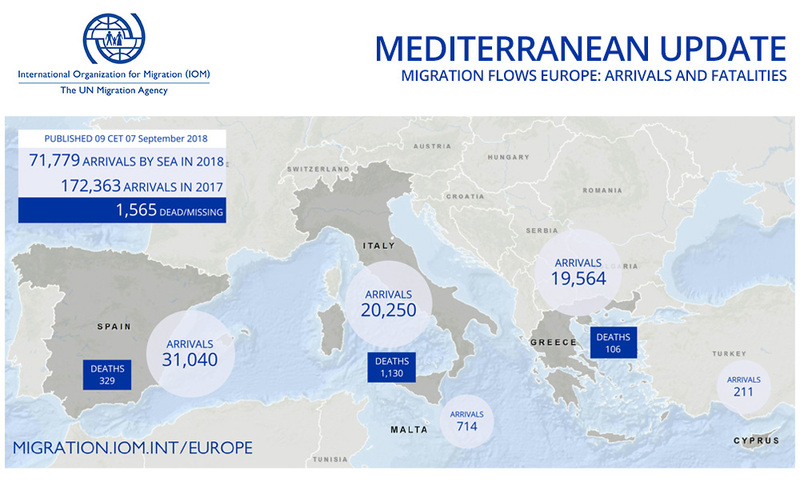 In addition, some 11,050 land arrivals have been recorded on the Eastern Mediterranean through the end of July, and an unknown number since 1 August (see charts below). IOM’s Marta Sanchez reported Thursday that IOM’s Missing Migrants Project has documented the deaths of 2,546 people during migration to international destinations in 2018 (see chart below). Globally, IOM estimates that more than 28,000 migrants have died since 2014. In addition to the recent Mediterranean drownings mentioned above, MMP reported that in the Gulf of Aden, 33 people lost their lives on 29 August when they were trying to reach Yemen by boat. Smugglers operating two overcrowded boats forced nearly 360 Somali and Ethiopian migrants into the sea as they approached the coast of Shabwa, a Yemeni Governorate along the Arabian Sea. At least 27 Ethiopian nationals (20 men and seven women) and six Somali nationals (four women and two men) drowned during the forced disembarkation. An estimated 156 migrants have been known to die or go missing while crossing the Gulf of Aden and the Red Sea to the shores of Yemen between 1 January and 1 September 2018. Along the border between the United States and Mexico, the harsh conditions of the arduous desert trek and the dangers of crossing the Río Bravo lead to hundreds of deaths each year. Between January and September 2018, Missing Migrants Project has documented the deaths of 281 migrants along the border. In their efforts to go north, migrants often must circumvent Border Patrol interior checkpoints. It is during these treks through heavy brush that many migrant deaths occur. Most recently, a 30-year-old Mexican man died of dehydration in Brooks County, Texas. His body was found on 27 August on a ranch west of Falfurrias on US Highway 285. On 29 August, US Border Patrol agents found the remains of a man of unknown identity on a ranch near a USBP checkpoint in Highway 83, in Webb County, Texas. On 30 August, the remains of a 36-year-old man of Mexican nationality were recovered from the banks of the Río Bravo in Eagle Pass, Texas. One day later, another man was reported drowned in the Río Bravo. His body was recovered on 31 August near Harlingen, Texas. US Border Patrol agents recovered skeletal remains from a ranch near Armstrong, Texas on 2 September. In Southeast Asia, one migrant worker from Myanmar died and 12 were injured when the bus in which they were travelling crashed near Thailand’s border town of Mae Sot.